If you’ve been to an Everett Silvertips game the last few seasons, you may have noticed him: a scoring machine flying up and down the ice, making plays that end in goals for the guys in green. If you haven’t seen Shane Harper in action yet, then get your tickets now, because he’s eligible for the NHL Draft this year and I predict he won’t be hanging around Comcast Arena much longer. The season is 53 games old and Harper has already racked up 24 goals and 27 assists for a total of 51 points. He’s scored 50 goals in his Silvertips career; only the third ‘Tip to reach that mark. Read any write up of an Everett game and I guarantee you’ll see his name somewhere in the story. (I highly recommend Nick Patterson’s Silvertips coverage in the Everett Herald). Here, Shane Harper takes a few minutes in between games to share his road to the WHL, the Everett Silvertips, and the upcoming NHL Draft. It was right on the rise of the hockey boom because when I started playing , that’s when (Wayne) Gretzky was playing for the LA Kings, so a lot of kids wanted to play hockey and we loved going to watch Wayne Gretzky play at the Great Western Forum. Did watching Gretzky play influence your decision to play hockey? It didn’t make me decide. I played all the sports growing up, all the usuals like soccer and baseball, all the normal sports and then my parents found a flyer to go play roller hockey. It was an outdoor rink, on top of the boards where was a chain link fence. It was a real simple rink and then I started playing roller hockey there. What made you decide to move inside for ice hockey? About a year later, I loved playing roller hockey so my parents decided to sign me up for ice hockey and that’s where the Kings actually practiced, in Van Nuys. I played, actually, with Gretzky’s son and daughter. They were on m y team, ah just by chance. Describe your transition from growing up playing hockey in Southern California to really getting serious about playing hockey and transitioning to the WHL. I played locally for years and then when I started getting better around the age of Pee Wee, I started playing for the Junior Kings down in El Segundo-LA area, and that’s when I became more serious. I was like, around 13 or 14 and that’s when I started to travel a lot. And then, 14, 15, that’s when I played for the California Wave and we traveled all over Canada, to some WHL cities and that’s when I made the transition. It’s obviously a pretty big jump, you know, playing minor hockey to playing in this beautiful rink and having a lot of people watch you play. It was a lot different and the speed of the game is very fast, but it’s an amazing thing once you get to play here. It’s a lot of fun. This year’s obviously been a good year for me. Last year, I kinda broke out, I guess; showed what I could do. The first years were a little slow, I guess, because it’s hard to get used to the league, but this year I just stepped it up a little bit more and hopefully I can keep it going. 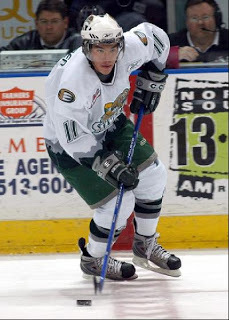 (Note: Shane was voted Most Improved Player by the Silvertips in 2007). Who’s been the biggest influence in your hockey career so far? My parents. Gretzky was one of my favorite players but I never had a close hockey (mentor). I kinda took my own path and my parents have always been there to support me. You’re eligible for the NHL draft this year. Any thoughts or dreams about where you want to play? I would just love to play in the NHL anywhere but I guess if I had to pick I’d love to play for the LA Kings. That would be pretty awesome. What can people expect when they come to a game at Comcast Arena for the first time? Fast-paced action. I know a lot of people who don’t watch hockey don’t realize how fast it is once you get there. There’s a lot of hitting. When I sat out this pre-season and watched a game, I was pretty impressed. It was really fun to be there, actually and just watch. I liked it a lot. I’m in an offensive role. I’m supposed to produce and score for my team and obviously be viable on defense, be responsible in my own end and then when we get the puck in the offensive zone, I’m supposed to make plays and produce. It was in Portland. It was my first year, before Christmas (December 13, 2005). The D-man shot it from the point and I tipped it in for my first goal. My first game ever was in Kamloops and the next game after that, I believe was at home. So it was my first ever home game, I believe and we won so that was pretty neat. Is there a loss that still kinda stings a little bit? Two years ago in playoffs when we lost to Prince George. We were up two games and they went on to beat us 4-2 so that was pretty hard to take. You mentioned Wayne Gretzky. What did you like about him, aside from the fact that he was great at everything he did? Yeah. Another thing was—he’d come out to our practices. He even came out to my birthday one year because I invited everyone on the team to my birthday when I was seven years old and he actually came and brought me a bunch of gifts so aside from the fact that he was a great player he was an awesome guy. Who’s your favorite player now? Pavel Datsyuk and Alex Kovalev. I’d say Alex Kovalev is my favorite player and Pavel Datsyuk is my second favorite player. You can’t even describe the way they’re gifted offensively and the hands they have, the way they can maneuver the puck, it’s like they’re magicians, it’s unbelievable to watch. A friend who writes about the Red Wings calls this one scoring play the “Datsyukian Deke”, because he’s just so good at the net. Yes. He makes goalies look like they’re in Pee Wees. I know we haven’t played there much but that new Kent (ShoWare) Arena. I always like playing in Kelowna. I really like that arena a lot. You had a really good night that first night at ShoWare Arena (January 3, 2009). You had two goals. One goal they disallowed. I would have had a hat trick. I ended up with two goals and an assist but they disallowed a goal so that was a bummer. Favorite thing to do when not playing hockey? My favorite thing to do when the weather’s nice is go play golf. When I was a freshman and sophomore in high school I played on my golf team in Valencia so that was pretty fun. I don’t really have a handicap anymore. I don’t play very often but I’ll shoot in the 80’s on a par 72. It always changes but lately I’ve been listening to Coheed and Cambria. A band I always like to listen to is System of a Down. Shane Harper is a rocker. He certainly likes to rock the rink, especially in the opposition’s end. So, get your tickets and get a first-hand look at the show. And if you get the chance to say hi to Shane, tell him Happy Birthday. He just turned 20 on February 1st. Then sit back and let the celebration begin!